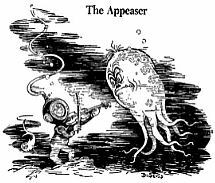 There’s a whole series of these anti-appeasement cartoons by Theodor Seuss Geisel in the Mandeville Special Collections Library at the University of California at San Diego. All of them are from 1941, and all are from before Pearl Harbor. It reminds his fans (of which I am one) that Dr. Seuss had a long and varied career. I always thought Dr. Suess was a Republican. My favorite Seuss creation? Horton the Elephant. Like Bush he meant what he said and he said what he meant! And an elephant's faithfull 100 percent! His books remain the single best resourse for teaching small kids to read and develop a sense of humor. As he got older, Dr. Seuss followed the Democratic party into the abyss. The Lorax was an appalling piece of environmentalist and anti-capitalist propaganda. I didn't read it until I was all grown up. I couldn't believe it was the same guy who wrote those wonderful fairy tales like "The King's Stilts" and "Thidwick the Big-Hearted Moose." That last one, by the way, can be read as an anti-welfare state allegory, with Thidwick throwing off all the lazy free riders at the end. Of course, there's also the denouement where all those animal chiselers get shot by the hunter! Couldn't get that one into a kids' book today, could you? With Dr. Seuss, I like to stop with the second cat-in-the-hat book and pretend that the later ones never existed. I think I have seen anti-facist cartoons of his that were published as early as 1938. Another bit of Dr. Seuss trivia: Yertle the Turtle was written as an allegory(?) about Adolf Hitler. note: I'm not absolutely certain if allegory is the correct literary form. Can anybody confirm or correct? I would caution you against the idea that being anti-Hitler made one not a liberal extremist. There were plenty of socialists and communists in the US and Great Britain who opposed Hitler but were sympathetic (even loyal to) Stalin. No, I realize that. I was contrasting his robust pro-American stance in 1941 with the pacifist, anti-capitalist and proto-Green stances of his later works. The difference is striking. In 1941 he was a good Democrat, opposing America First and following the FDR lead (which was preparing America for the inevitable conflict with the Axis). The liberals might have allied with the Reds back then, but they hadn't yet become them. Interesting factoid: Geisel lived up the road from Raymond Chandler on the coast south of LA after the war. They were alledged to be drinking buddies for a time. I wonder what Chandler would make of the current crop of blow dried red tie wearing pols..I think he would have described the present congress as older brothers of the Bay City City Council..
From my understanding (there's a book out with a lot of these, including one with Hitler and Tojo or Hirohito running chasing each other around a table with their pants down), it wasn't just that Geisel was pro-Stalinist-as-ally, he was largely pro-Stalin. Of course, that's before the revelations about Ukraine and such got past Duranty and The New York Times gatekeepers. But still, that makes the walk from Like America/Love Communism/Hate Fascism to the Hate America/Love Communism anyway/Hate Fascism of today's sorry bunch a short one. I think shows one anti-appeasement cartoon from May 22, 1941 (the US as a tree as Hitler pecks down various other national trees). "pretend that the later ones never existed" - same goes for Walt Kelly. Hmm - if you search the collection for images of Stalin, you can't help but think Dr S was very highly disposed towards him. Most are of the "kindly Uncle Joe gives it to the nazi rats" variety, but check out the Feb 19, 1942 offering for out-and-out pro-Soviet feeling. After all, Stalinst anti-semitism was no secret, but like many liberal Jews, Geisel was able to overlook it. There is also a kiss-up to Molotov, and a plea for people to listen to Norman Thomas and "think", among the collection. dwpitelli is quite right. You might want to take a look at one of my old posts, Baron: Did the American Left Support Democracy in World War II?. It got Instalanched back in the day. Dave -- see my next post. I missed mentioning this a few years back, but I linked to your article from Legal but Dangerous.